Cylinders in Plane (CiP) designs, manufactures and assembles a unique reciprocating compressor for OEM distribution to compressor manufacturers and distributors throughout North America and abroad. 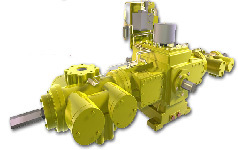 The CiP reciprocating compressor product line was developed in 2000 specifically targeting higher pressure applications in the small to medium horsepower market. The CiP compressor offers a truly balance opposed design that allows absolute alignment of opposed cylinders to eliminate vibration associated with the horizontal couple for smooth operation, increased efficiency, reduced service cost, and long-term reliability. CiP incorporates a complete line of cylinders on three primary models (PXT, PHT, and PVT) capable of handling a multitude of natural gas applications in drastically varying environments and pressures.